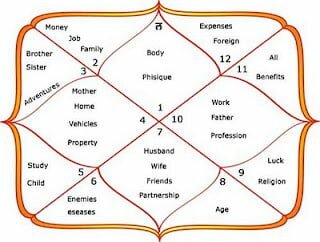 Home » Astrology » How To Calculate Ghati Lagna? One of the most important Lagna or ascendants in Vedic astrology is Ghati Lagna. Similar to many other elements of astrology like stars, moon and planets, the Ghati Lagna also makes an effect on the different aspects of human characteristics and personality. The effects of Ghati Lagna are different on different people. This effect mainly depends on the position of Ghati Lagna in your birth chart at the time of the birth of the individual. One can get to know about the position of Ghati Lagna by calculations and this position is marked in the person’s horoscope. Ghati Lagna (Ascendant) can be considered to be highly significant in day to day life. There is a consistent power struggle in most of the aspects of the current world. This struggle or otherwise known as the power politics could be seen in almost all the cases. Sometimes people are directly involved in this struggle and at other times the involvement is somewhat indirect. However the bottom line remains that the effect and ramifications of this power struggle affect all alike. The different questions that might arise in the minds of the people due to social aspects like power struggle, public reputation, and authority could be answered with the analysis and subsequent interpretation of this analysis of the Ghati Lagna position. There are many experts who help the people with an analysis of the Ghati Lagna, however these experts are quite expensive and it is a bit difficult to approach them. Moreover the authenticity, accuracy and precision of their readings cannot be guaranteed. However one can avoid this entire situation by using the Vedic astrology calculator presented over here from the comfort of their homes. All one needs to do is enter a few details like the full name, the date and time of birth, the time zone and the latitude and longitude for the exact location. Having done this the button with Free Ghati Lagna is selected and a detailed report comes up. If the correct details are entered then a detailed report comes up. This astrology report contains the planetary details, the Vedic Ghati Lagna details and the Ghati Lagna presence sign’s characteristics, which contains the Vedic name, the type of sign, barren, the consistent character, the best direction, the part of the body, the Ghati Lagna present in sign, the nature, the gender, the cast, the lucky days, and colors and the physique. In addition to this the report also contains the names of the zodiac signs with which the compatibility is good and bad. The analysis of nature and key personality traits also gives suggestion as to what should be done for a better future. The health analysis basically tells about the bad health symptoms that one may face. Thus anybody and everybody who is curious about his or her power and social status should take this test and get to know about themselves.